Way back in 2005 Chris Nelson laid down the foundations for this very large MSTS route. Unfortunately, Chris had a couple of route crashes which made the route un-usable. I offered to try and fix the route and Chris passed it over to me in 2008. Luckily, I was able to repair the route and get it all working correctly again. Version 1.0 was released in 2010, and covered the Main North line from Maitland to Armidale, and the branch from Muswellbrook to Merriwa – this was released as an internet download on the steam4me site in August 2010. Having published the V1 route, I moved on to work on V2 – this covered the branch from West Tamworth to Barraba, the main line from Werris Creek to Narrabri and Moree, and the cross-country line from Werris Creek to Binnaway. There was a delay in publishing this version during 2012 and it never entered public distribution. Undaunted, I moved on to the V3 sections – this covered the main line from just south of Mudgee to Gwabegar and the branch from Craboon to Coolah. I have pleasure to announce that the full V3 route is now, at long last, finished – six long years of my time, however there were some significant breaks as I attended to other non-MSTS activities, as well as several other MSTS routes during those six years. The route covers nearly 1000 miles of main line track. Computer Requirements - I have only tested this route on my own PC – I’m a single route developer, without any assistance. My PC is around six years old and has an AMD quad-core Phenom 2.31 Ghz processor, 4GB of RAM, a 1GB nVidea GeForce 9600GT graphics card, and a 500GB HDD, running under Windows Vista. My MSTS installations work very well with this setup, and I’d suggest that at least similar specifications are required to run the route. I have also done a few small tests on an older slower laptop running Windows XP with only 1GB of RAM. Software Requirements - Of course, Microsoft Train Simulator with the last MS issued version 1.2 updates – my installation is running on tsection.dat Build 38 - you must have the latest version of X-tracks installed – you must have the latest version of New Roads installed. Details of these setup requirements can be found on the steam4me website. One last thing – I always use the last stable version of MSTS-BIN (see steam4me) – I have NOT TESTED this route without BIN installed, so cannot vouch that it will work on a ‘straight’ MSTS installation. Additionally, I’ve done some testing with Open Rails V0.9 Beta version – the route seems to work well in OR without fault, bearing in mind all the MSTS operational features have not yet been fully implemented in OR. As I’ve mentioned, I’m a sole developer, and don’t have a crew of Beta testers. During the building of the route, I have done extensive testing, and am satisfied with the final result. Occasionally, you may find a few very minor faults, like a few floating trees, small terrain over the track base. The route will be supplied in this state – ‘as is’ without any guarantee the route will have future upgrades or corrections. I simply don’t have time to fully detail test nearly 1000 miles of track. Details of how to install the route will be included in a Read-Me document with the DVD. How can I get the route - As the final route is around 3.2GB in size, it cannot be distributed via internet download, so it can only be obtained on a DVD. I’m not a production house, so any copies will have to be scheduled into my weekly activities. Now here are the details – I’m going to have to place a small monetary charge on the production of the route disk. This will cover the cost of the blank disk, the cost of the postal container, the burning and packing of the disk, and my time to attend the Post Office. The amount will be $10 – I don’t have any credit facilities, so the amount will have to be in the form of a $10 note, folded into several blank A4 pages to disguise the cash in the envelope, and posted to me. I will not be publishing my postal address, as it can be harvested by web-bots, so you will have to send me a Private Message with your postal address, email address and contact details. I will respond to you with my private postal address so you can then send the route fees. I will collate all orders received between Monday Morning’s mail and Friday Morning’s mail – the required number of DVDs will be produced over the weekend, and the finished disks posted out on the next Monday morning. The route can only be obtained using this procedure. If any of your personal friends also want a copy of the route, you are permitted to get a blank DVD from them, and make them a copy of your route master, at NO CHARGE. This route cannot be hosted on any internet file sharing websites. I have already expressed an interest in this route, and discussed how best to arrange a copy to be sent around the world. We agreed that transferring the nominal sum suggested by Brian would involve additional costs out of proportion to that sum. Brian therefore suggested that perhaps I could act as his "agent" in the UK, although any costs involved would only relate to the cost of a disc and postage within the UK. One potential method would involve the requester sending a stamped and addressed DVD box, or Jiffy type bag, enclosing a suitable DVD in an envelope to myself. I would then copy the route onto the disc and return in the enclosed box/Jiffy bag. Initial interest would be expressed by PM and/or email, following which I would send my address details by return. We have only just discussed this and the route is not yet in my possession. However please feel free to make contact at this stage. The DVD contains the route ONLY – unlike MSTS disks distributed in the UK, there is no rolling stock included and no activities included. 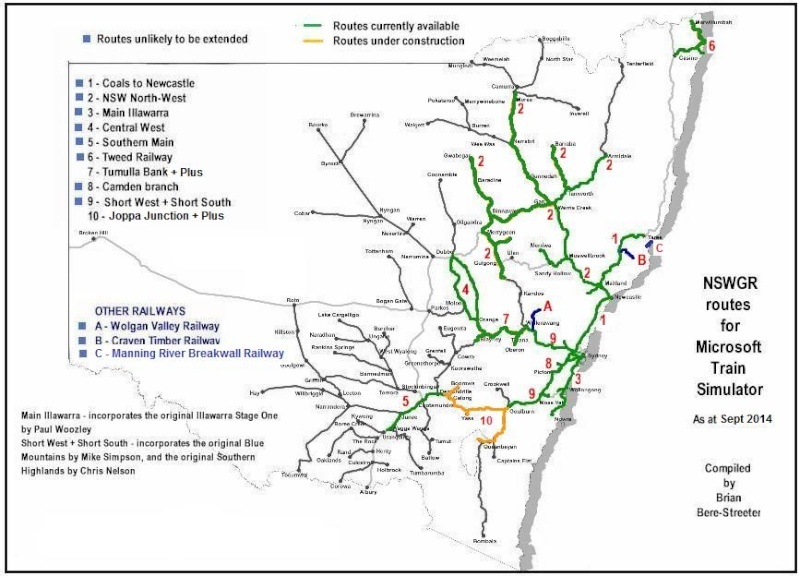 However, I have included a comprehensive set of pre-defined Paths for all typical passenger, goods, mixed and coal trains in accordance with NSWGR working timetables. In your MSTS installation, you should be able to select a suitable Consist from your drop-down list, then select a Starting point, and an Ending point, and be able to drive that part of the route in Explore mode. All parts of the route are accessible with this set of paths. One of the main problems with including rolling stock (unlike the UK) is that available stock is hosted on several websites with varying conditions of use and by numerous authors, some of whom have left the MSTS scene. The situation is additionally complicated by the presence of several major Payware stock packs that are pretty much essential for a proper display of NSWGR practise. The logistics of trying to seek permissions for all the stock to go on the DVD would be near impossible. The Short North Carriage and Wagon Works – this is my own site, with all my available models hosted as freeware – feel free to use my stock, but it cannot be hosted on any other websites without my permission, nor can it be sold for profit. Coals to Newcastle – Peter Newell’s site – most (if not all) of my stock is also hosted on the CTN site as a duplication, in case my Short North site (hosted on steam4me) disappears for any reason. Peter also has a good selection of stock made by other authors. Steam4me – the well-known site hosted by Yuri Sos – contains just about all of the other Australian stock that is available as freeware. Team Alco – is the only Payware MSTS provider – the main items of interest are the Class 36 pack, the Class 38 pack and the Class AD60 packs. Whilst the 38’s and the AD60’s are also available in a freeware form, the Class 36 are only available in Payware form. The other main problem is that within the Australian MSTS world, there are literally NO activity writers. In the UK where a route author can pull together a team of assistants to build special stock and write a host of activities for a route, it unfortunately does not happen in Australia. As for users who want to write their own activities for this route, I have included extensive guidelines documents in a folder called “Activity Support Information” with heaps of prototype information to give the writer most of the information they need to make their own activities. There is also a massive amount of prototype NSWGR information available on the Coals to Newcastle website, including Working Timetables, etc. It would be great if some users created interesting activities and shared them with other route users. Following on from Brian's comments above, it should be noted that the suggested Team Alco items are available from UKTS CD ordering. Have you considered using torrents for distributing something like this? They get a bad press but have legitimate uses such as this situation. Or you could use a dropbox type download such as was done with the KWVR route. As was stated in the first post the file comprises 3.2GB of content, and hence an internet download is not necessarily practical. Whilst "torrents" might be OK in some instances, my understanding is that the method outlined in both Brian's and my posts is to be the adopted one. Let's not get talking about torrents / Dropbox etc., I made it quite clear in the first post, the route will NOT be hosted on any internet file hosting sites - the route is ONLY available on DVD. There are two audiences for the route - Australia (maybe 90% ?) and the UK (maybe 10% ?). For Australia it is quite straightforward to send a $10 note and get a posted disk in return. For the UK, Alec has kindly offered to undertake distribution - all it takes is for you to contact Alec, send him a blank DVD in a self-addressed and return stamped package - he will burn the disk and send it back to you - this way Alec is NOT required to outlay any money, only his time to process the disks. Something else - the disk size has grown from about 3.2GB to about 3.5Gb, as I have also included a BONUS route - 'Tumulla Bank + Plus' - this route extends from Wallerawang in the east to Orange East Fork in the west - it includes the famed Oberon branch from Tarana to Oberon, and part of the Cowra line from Blayney to Carcoar. Tumulla Bank + Plus is the 'missing link' between my 'Short West + Short South' route and Chris Nelson's 'Central West' route - you will be able to drive from Sydney right through to Dubbo (albeit over three routes). I have now received a DVD of this magnificent route, and sent out a copy to meet the first request. Let me know by PM if anyone else is interested? The Team Alco stock is excellent quality and comes with up to 20 consists, and hence would be of interest to those who like their stuff ready made! There is also copious freeware stock available through Steam4me, and this includes a jumbo pack of C38 locomotives by Justin. The whole experience should create a new stimulus for we MSTS stalwarts! Sounds like another super Route like MEP will it be a MimiRoute available from UKTS also please?? No Art,it is not a Mini Route,nor will it be available on UKTS,the easiest way to obtain it is through Alec (Rufuskins). May I advise you that no stock or activities are included with this route. You would need to download the stock from Steam4Me, and, maybe, purchase the Team Alco stock CD from UKTS CD ordering. You will be able to run all over the route using your own stock in Explore mode as numerous paths are included. Just to reinforce Ged's post, let me reiterate that this route is ONLY available direct from Brian in Australia and from myself here in the UK. "The method requires the requester to send a stamped and addressed DVD box, or Jiffy type bag, enclosing a suitable DVD in an envelope to myself. I would then copy the route onto the disc and return it in the enclosed box/Jiffy bag. Initial interest would be expressed by PM and/or email, following which I would send my address details by return." I have already despatched one copy. The route does not have any activities included, but comes with a number of paths allowing exploration of the route. In addition, as has also been stated, freeware and payware stock is available from Steam4me and UKTS respectively. My understanding is that in Australia activity creation for upload is not as popular as here. I have already downloaded a substantial amount of freeware from Steam4me and I am going to be creating a number of consists based on Brian's documentation. Assuming that it is acceptable I can make these consists available for general use? I should also point out that the Team Alco stock packs from UKTS come with up to 20 consists for each locomotive pack. Could this be copied onto a USB memory stick instead of a DVD? not sure if there is anywhere locally where I could buy a single/small pack of DVD-R disks and boxes, they only seem to do large multipacks of both which is a bit wasteful/expensive when only one is required, but I do have a few memory sticks (USB flash drives) here. That's a good suggestion, Mark! May I make another one? Many PCs these days are equiped with a multimedia interface which will accept SD cards. These are available in many capacities, but I'm not certain of the current prices. They are very thin, if taken out of their case, and can be posted as normal letter mail - I recently sent one to my sister in Devon, enclosed in a greeting card! Of course, this assumes that Alec's PC is so fitted .... but an SD card reader, which plugs into a USB socket, can be obtained from the Pound Shop!! As of course can DVD+ discs, Ged ,or at least they can down here,five in a pack for £1,that's not bad. Thank you everyone this is not a Route for me but thank you all for trying to advise me. Just a quick update - I've been getting some feedback from those who got the route. The only (minor) error message coming up is if you do NOT have my custom NSWGR buffer stops installed, it will spit the dummy. Install it as per enclosed instructions - this goes in the global folders rather than the route folders and will replace the default bufferstop in all routes.